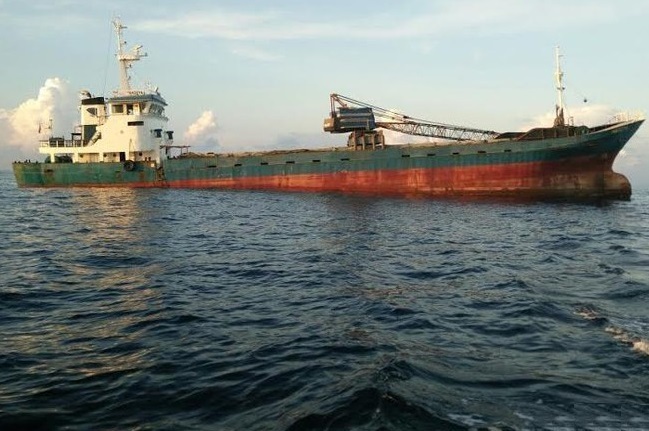 The general cargo ship Nagoya partially sank in Java sea, resting the bottom in shallow waters off Sumenep in East Java, Indonesia. The vessel was en route from Banyuwangi to Lamongan under ballast, when engine room leak started flooding the stern. 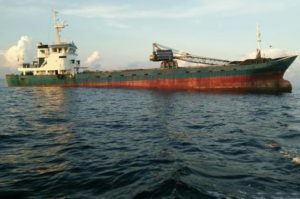 The crew headed to shallow waters on 2 nautical miles from the Kantorpos Gayam island and abandoned the cargo ship into a lifeboat. All the 14 crew were safe and rescued by nearby fishermen without reported any injuries, while the sinking general cargo ship Nagoya rested the bottom with the stern and remained partially above the water. The accident was reported to local authorities and salvage of the troubled vessel will be considered during the next days. The investigation for the root cause of the accident is under way. The sinking probably was caused by technical problem, but details are not yet clear. There is no oil leak reported, but on board of the cargo ship there are several tons of fuel and authorities are monitoring the area for water pollution. The general cargo ship Nagoya (IMO: 8631051) has overall length of 57.20 m, moulded beam of 9.50 m and maximum draft of 3.50 m. The deadweight of the ship is 617 DWT and the gross tonnage is 664 GRT. The cargo ship was built in 1987 by Saidaiji Shipbuilding in Okayama, Japan. The owner and operator of the general cargo vessel Nagoya is the Indonesia company Samudra Raya Indo Lines.